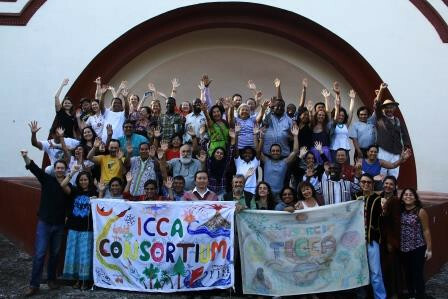 Throughout 2016 the Consortium worked hard to advance the ICCA Global Support Initiative (GSI) and improve communication. Results kept flowing—including four major regional capacity building events and support provided to many national catalytic processes… but we did not manage to complete the new web site, as we had hoped, and we do not feel confident with all national catalytic organisations identified and contracted by our GEF SGP partners. In terms of international policy, we found it harder than expected to move beyond our conservation heartland, where we built upon extensive prior work, experience and trust. In conservation policy, however, our results surpassed our hopes at both the World Conservation Congress (September) and at CBD COP 13 (December). These results are summarised in Annex 1 to this report. We also made significant achievements in terms of research, publications and communication products, completing two Policy Briefs on conservation issues (one in English and one in Spanish) and three 20-minute videos on governance for the conservation of nature… As mentioned, however, we have struggled with the other Briefs we had started, in particular those dealing with ICCAs and climate change/ energy policy and with ICCAs and Sustainable Development Goals. In 2016, we maintained and nourished our experienced partnerships with the IUCN Global Protected Areas Programme – with whom we collaborated closely for the World Conservation Congress in Hawaii and for the organisation of two major events on governance of protected and conserved areas in Iran – and with UNEP WCMC, with whom we advanced towards effective and sensible ways of including ICCAs in the WDPA with the support of national peer-review processes. For that, we collaborated to develop a number of publications in various languages. We also extended ourselves into new partnerships, in particular with Friends of the Earth International (FoEI), with whom we developed a Memorandum of Understanding related to the ICCA Alerts and SAFE. The progress on SAFE was—admittedly—less rapid than expected. While it is true that we now have a much clearer understanding about what should happen, we have not yet taken any strides to actually make it happen on the ground … besides nourishing a relationship of trust with FoEI. Importantly, 2016 is when the Consortium became fully aware that it needs to embark on major institutional change. The personal engagement and volunteer energy that gave it life and meaning have to remain… but the leadership should be prepared to pass on its role and the Consortium Secretariat cannot be counted on to continue forever without higher levels of compensation and job security. Both of these require more complex administrative services and demand greater institutional engagement from Members and partners alike. We first understood this when considering whether we were able to take a direct leadership in the operations of SAFE (the answer was that we were not, if we were to stay within the existing administrative structure) and the idea became clear when we approached the new Strategy. We thus prepared ourselves for institutional changes to come, starting with the organisation of one of the largest General Assemblies we have ever had. The General Assembly of 2016 elected a new and substantially enlarged Steering Committee. It also approved our slightly revised Statutes, a new membership policy as part of extensive Operational Guidelines and shaped the key elements of a new Strategy for the Consortium as a whole. Last but not least, we should note that in 2016 the Membership of the Consortium passed well above the bar of 100 Members (organisations) and 250 Honorary members (individuals).